OzBargain April Fools pranks over the years: 2013, 2014, 2015 & 2016. At OzBargain it is all about getting the best value for your money, by finding the best bargain for the products you want to buy. However how do you actually define value? At the beginning of human history, bartering was the mean for individuals and groups to trade what they own with what they desire. However as the civilisation advances, currency was invented a few millennium ago as a more efficient way to quantify value. Today the most used currency in the land of Down Under would be the Australian Dollar (AUD), but occasionally we also see deals posted on OzBargain in US Dollar, British Pound or Euro. However we still have not define the value of one Australian Dollar (AUD $1). It’s an arbitrary concept that might mean different things to different people. At OzBargain we believe we need a better representation of value — a currency that we all understand. Units of 1.2V 2000mAh AA Eneloop as an alternative currency is not a foreign concept to seasoned OzBargainers. Members have been calling it "OzBargain currency" whenever an Eneloop deal was posted. While AUD might have been stablised at around $0.75 USD over the last year, with Trump at the helm you never know what will happen to the world economy. 🔋ENE could as well be the future currency just as some of our members has predicted. Discussions of value on OzBargain would be so much easier to understand! To help OzBargain transitioning to 🔋ENE, auto-conversion will be performed on all the deals and forum posts at the rate of AUD $2.50 to ENE 🔋1, as an OzBargain Professional would never pay more than that for one. The auto-conversion should also work with British Pound and Euro, and our engineers are still working on getting the US Dollar to convert correctly. On pages where currency has been converted to 🔋ENE, you can move your mouse cursor to hover over the new currency to reveal what the original value is. You can also choose to disable the automatic conversion all together, if you are not ready to brace the new OzBargain currency. That’s it for this announcement. Live long and prosper (in accumulation of Eneloops). I don't like this ENE stuff, how can I turn it off? 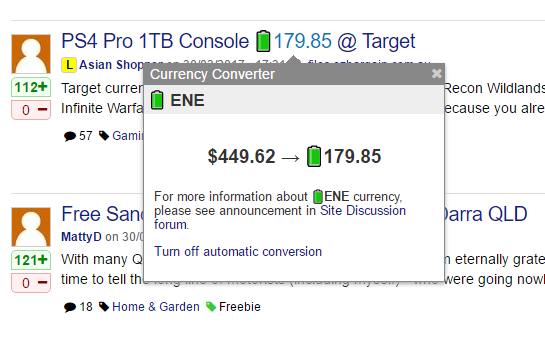 Hover or click on any ENE currency on the page that has been converted. Click on "Turn off automatic conversion" link at the bottom of the popup. At the moment there is no way to turn it back on again — something that we'll be working on soon. April fools! Nice one. But I have no idea what the real discount is on some of the deals now lol. It's baffling. Not really, it's 1.21 gigwatts. Easy, there'll be a front page deal soon with an extra cashback amount for ebay. It's about 0.00000000274 eneloops and every will go beserk over it… cause it's extra cashback! What is that in Moes? I was banking in the Tesla Power Wall 2 as my Gold Billion equivalent! Leaving the ENE as my daily currency! Not to forget my 10,000MAh powerbanks taking the place of my credit cards. I hope you've considered the inflationary risk of charge loss. Maybe you can then sell OzBargain to Catch of the day on escanjve for eneloops. May I be the first to say 2170 rulz and Eneloops are for noobs. Units of 1.2V 2000mAh AA Eneloop as an alternative currency is not a foreign concept to seasoned OzBargainers. I went to McDonald's the other day and they asked me if I wanted Eneloops with that. Aw for a moment I thought Scab was out of the penalty box. When does the ENE trading exchange open? Some analysts are predicting a surge with a flattening commodity market spiking cause investors to shift their energy into Eneloops. I want in as it'll be comparable to nickel and copper no doubt. I just called Philip William Lowe and reported this! What happen when ENE currency is overruled by BITENE (as opposed to BITCOIN) currency? How do we enable/disable this? You can disable to by clicking on "Turn off automatic conversion" on the pop up. Sorry no way to turn it back on at the moment. Sound loopy to me .. :-) .. !! Finally something to do with all my eneloops! Now the new cry will be: Eneloops in title! @ Scotty, I think you should also replace the +- with voltage. Not gonna lie, I've been reading it as "+2 Volts" instead of "+2 votes". I just gave you a jolt. Is the value of the ENE affected by whether or not they are charged? Yay, finally ENE is tradable now. Enjoy oz fool day !!! I tried to give officeworks 3 Eneloops for for my purchase, somehow they looked at me with a funny face. I feel so out of the eneloop, I have no need for an endless supply of batteries. Damn will target store refund my ps4 video games and issue me ENE or store credit? I don't want batteries as refund for my games. Funny. How to turn off on a mobile phone? Same method. Tap on the converted Eneloop currency, and click on Turn off automatic conversion. Got it. Thanks. When i click on it, it goes to deal, but if i go back, the option is there to change. This is not going to go all day is it? Will I short ENEs when I carry them in my wallet? Is that treated as demonitization? I hate this. I have no idea what anything is worth, and have to click on the blasted green thing to find out. Make it go away please. @scotty, can I please have more negative votes just for today? I one word, this is Sh!t! This is without doubt the worst April fool feature OzB has run… I'll be back tomorrow when this rubbish is over. Ha yes. Even the April Fools features from the good old days were better. We should definitely add that feature here. Sure is! They probably left it too late. I have no idea why all these people on OzBargain but does not want Eneloop? I have now added an FAQ entry to the original post on how to turn off the automatic conversion. That ruins the fun part. I think it would be so much better to have this symbol represent our buying power and when you hover over the price tag it would show RRP. Example: 'Tiger Rice cooker 🔋300'. If this were launched earlier, DSE won't go out of business. They becomes the bank. *PS - my religion changed this week when I won the Energizer $5000 competition! Burn at the stake heretic! Can I use eneloops to recharge my prepaid phone credit? I am sure it recharges both your prepaid phone and prepaid phone credit. swiggity swag on 01/04/2017 - 10:02 Comment score below threshold (-4). holdenmg on 01/04/2017 - 10:09 Comment score below threshold (0). Change it back or you'll find a lot of people will stop using this site. That can only make it better, bye. ASX:ENE Energy Developments Limited tipped to soar at open on Monday. I'm an April fool - I completely thought this was a serious, but quirky, addition to the site. I resolve to be less credulous. And to buy up on eneloops in case there's a run on them. Unfortunately, there are already reports of 7/11 paying employees with Eveready Super Heavy Duty when Eneloops were agreed on. Can someone please shed some light on these eneloops? How did it all started and how the ozbargain community embraced it like they're prepping for something? nuclear holocaust by the sounds of it. edit: btw, I like the new logo. You mean the old logo. I'm sure I saw a different logo this morning in desktop. Ohmy goodness, there appears to be resistance to the new currentcy. My phone is going off like a pinball machine with all these 'classic' deals being posted! You could use this prank in the future to auto change currencies for future bargains? All I'd say is, if it ain't broken don't fix it. Time for our own sovereign nation with Scotty for PM. The real question is, is the new Eneloop currency B28 capable?!?!?!? How do you determine the differenced in China made Eneloops and Japanese one's? It's flawed to think that they are worth the same.